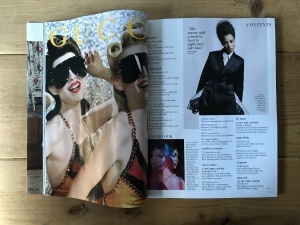 Discussion in 'Ad Campaigns' started by vogue28, Jan 30, 2019.
bluestar, Morgane07 and StockholmFW like this. Oh my!!! Gucci strikes again. I need to see this in full. Oh wow! This looks straight out of a Fellini film! Vibrant without being tacky. Cinematic while still showing off the clothes. Artful without being pretentious. I need to see this in full but I have a feeling this is Michele’s best campaign yet for the house. I still don’t care for his collections though. YohjiAddict, ForTheImage and grimm like this. bluestar and grimm like this. Amazing. I only wish the clothes were on the same level! Ahhh finally! It's been dull more than usual with the concepts this campaign season (with the exception of few), and thank God for Gucci coming through once again. I only wish the clothes were on the same level! entten, Ken Doll Jenner, dior_couture1245 and 1 other person like this. I agree. Truthfully, though, in the context of the ad campaigns, the clothes don't bother me in the slightest. 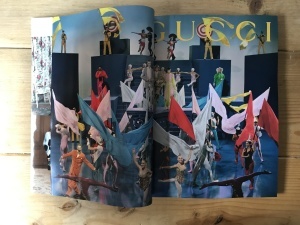 It's really the shows (and lookbooks) that are ultimately the losers in these rollouts of new content from Gucci at this point. The ad campaigns are so joyful, so infectiously fun and so well executed, that all the other ways in which the clothes are presented end up really lackluster and dour. The shows really could be skipped for all I care...they do nothing but drag things down with their freaky casting and somber moods. All that eclecticism that Alessandro wishes to pursue ultimately shines brightest here in the campaigns with Glen. 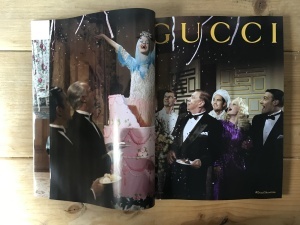 If he really wanted to shake up the fashion system, I'd suggest he cancel all future Gucci shows and treat these campaigns as lookbooks (because even the lookbooks themselves are fairly useless - especially when the product is as monotonous as it is with Alessandro). Skip all the expenses of the shows and put it into more of these glorious campaigns. They're so worth it. The shows aren't, anymore. The shot of the model popping out of the cake is just DIVINE. Frida, Benn98 and bluestar like this. WOW, this is absolutely gorgeous. So cinematic. Actually took my breath away. Love that one too! Reminds me of the narcoleptic stripper in Arrested Development. rubydon, guimon, 333101 and 1 other person like this. Ugh, obsessed! Without a doubt the campaign of the season. Love the stiff and rehearsed Miles Aldridge vibe. How is it possible that Luchford's creativity only manifests for Gucci's campaigns? YohjiAddict and CocoM like this. Maybe they have Christopher Simmons. This one can’t submit with others.